Milton Keynes Lightning are off the bottom of the Elite League for the first time in weeks after two wins in three games – the latest being a 4-1 victory over closest rivals Coventry Blaze on Sunday at Planet Ice. On Saturday former head coach Peter Russell’s Glasgow Clan gained revenge for last week’s 6-1 loss to Lightning when they won 6-3 at Braehead Arena. The change of fortune follows the departure of MK’s coach Doug McKay with players Ryan Lannon and Tim Wallace taking over the reigns – Lannon, currently injured, has been running the bench. Recent signing Robbie Baillargeon bagged a brace in what was a cohesive performance against Coventry with plenty of team spirit – at times one was left with the impression that players would have died for each other if they’d been asked to do so. Blaze were caught out as early as 2mins 14secs while Ross Venus was serving time for slashing and Ben Lake was serving time for abuse of an official. Eric Neiley’s pass across the face of goal found Andreas Valdix at the back door to slot home into what was effectively an empty net as goalie Miika Wiikman was caught out of position. Lightning struck on a five on four powerplay 90 seconds or so later. This time Baillargeon finished off at 3mins 49secs following a scramble in front of the net. Coventry hit back on 6mins 43secs through Luke Ferrara – his blast from the right of goal defeating goalie Patrick Killeen. A tripping penalty on Nicolai Bryhnisveen led to Lightning’s third goal. Man of the match Martin Mazanec’s blue line blast rocketed into the net at 14mins 22secs. Blaze could make no headway after Meidl was penalised for slashing in the 25th minute – in a well defended penalty the visitors’ Kelin Ainsworth was about to unleash a powerful shot when his stick broke. As the period edged towards its end Jake Hansen had a couple of decent efforts with Mazanec serving time for slashing but the score remained 3-1 at the second break. There was an anxious moment at the start of the final session when Tim Crowder went one on one with Killeen – however the netminder was able to pull off a glove save. 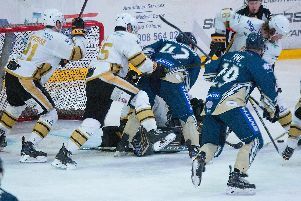 Lightning faced a five on three penalty midway through the period after Nelson Armstrong was called for slashing and the team was penalised for too many men. Blaze still could not cut the gap though as the home defended their lead with bodies flying here, there and everywhere. Any hope Blaze had of retrieving the situation was killed off as Neiley broke up the left and fed Baillargeon, in front of the net, to make it 4-1. Three Glasgow Clan goals in less than five minutes ensured a 6-3 win over Lightning at Braehead Arena on Saturday. MK were without suspended goalie Patrick Killeen and Cole Shudra plus the long term injured Ryan Lannon, David Norris and James Hounsome. Clan were missing the banned Brendan Connolly and Zack Fitzgerald. Adam Goss took over netminding duties, while on loan Jordan Boyle from National League side Whitley Warriors was back-up. 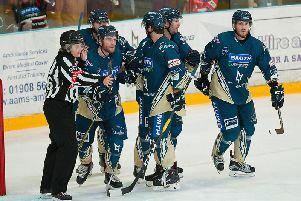 Clan’s opening strike came on 14mins 31secs – Matt Beca was the marksman, assisted by Vaclav Stupka and Scott Pitt. A great tap in by Michael Fine – aided by Robbie Baillargeon and Neiley – put Lightning level at 28mins 4secs. But parity did not last long as Beca set up Pitt to edge the home side ahead again on 29mins 57secs. It was the start of a three goal blitz which saw Travis Ehrhardt score on 32mins 37secs before that man Beca struck after 34mins 31secs to put Clan firmly in control at 4-1 – a score which did not change before the second period break. Things got worse for Lightning 52 seconds into the third session though when Josh Gratton registered unassisted to extend Clan’s advantage to four goals. MK reduced the gap again on 42mins 3secs when Owen Griffiths and Rihards Grigors were involved as Georgs Golovkovs beat goalie Joel Rumpel. And there was vague cause for hope of a turnaround in the outcome when Rumpel was caught out again with a Trevor Morbeck assisted marker from Fine just over a minute later at 43mins 10secs. However that was extinguished with a short-handed goal when Gratton struck again after 52mins 3secs to make it 6-3 while Craig Peacock was serving two minutes in the sin bin for tripping.